With over 50 years of sourcing experience, we bring with us a deep understanding of both the Asian manufacturing culture, as well as in-dept understanding of the retail industry. We have offices around the world giving us an global advantage. Expanding on our core business of home textiles, Amrapur overseas is a leader in development of products across several areas such as home decor and furniture. Our team is made up of experts in field, combining many years of experience in all aspects of the business from sourcing, engineering new products, design, logistics to name a few. What better way to revamp your bedroom decor than with stunning new bedding? The Amrapur Overseas Down Alternative Reversible Comforter is Hypoallergenic, crafted from super soft microfiber and contains a 100% all-polyester fill that will provide endless comfort. 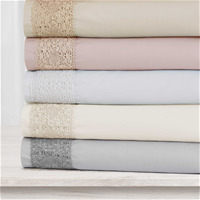 Choose the color combinations you love the best and get ready to climb into a soft, warm bed! Suggested for all-season use and machine washing is recommended. 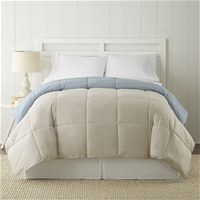 Includes (1) Down Alternative Reversible Comforter. Perfect for all-season use! Our ultra-plush comforter offers year-round comfort, adding convenience to luxury. It will keep you warm on the coldest nights, and comfortably cozy during warmer seasons. This versatile comforter offers the added bonus of being reversible, featuring two equally attractive colors on both sides. Simply flip it over for an instant, dramatic décor change. The hypoallergenic material provides a barrier to protect against dust mites, mold, allergens, and mildew. It is the perfect choice for those who suffer from allergies and/or asthma.